The literature is clear: jurors afford eyewitness testimony enormous weight, yet it is often inaccurate and unreliable. Eyewitness Testimony: Strategies and Tactics helps you understand the perception process, then pinpoint how and where inadvertent mistakes can occur. It predicts the probable direction of the error and even suggests ways in which this information can be effectively brought before a jury. 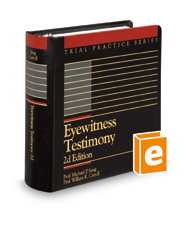 Provides practical guidance on handling the mistaken eyewitness at every stage of the litigation process—from pretrial to closing argument.